Denormalize means to make something not normal any longer. Here, with regards to religion, it means to remove religion from mainstream acceptance, declare it passé, and to reflect upon it as history and not as something that is still normal to practice. The term is borrowed from the anti-tobacco lobby where it is used to counter the tobacco industry's glamorization of smoking. The anti-tobacco lobbyists would love to see smoking reflected upon by the general public as something that is useless, polluting, hazardous, detrimental to people’s health, and unacceptable to do around other people. Before that, the word denormalized had been in use as a technical term regarding the organization of information within a database. Slavery is one example of a practice becoming denormalized. Another example is drinking and driving. Religion is slowly but surely being dropped from peoples' everyday agenda and one day it will be considered a passé practice. Eventually, laws will need changing and social curriculums will need changing. When enough of the population considers religion to be comprised of laughable yet dangerous ancient untruths, then the effort to denormalize religion within society will esculate unstobably until the job is done. This website will grow to a full discussion of the denormalization of religion; why religion is falling away from the norm; why the process should be hastened; and what effects that it will have on society in general. Hopefully, this website will be developed into an expanded website where people can participate in the discussion and/or watch the progression of the process. I love to be encouraged and to be corrected so feel free to send me an email if you're so inspired. I will write more about myself later. For now I'll just say that I have been an atheist all my life and in 1996, posted a website at www.atheists.net that is still up, but needs to be reworked. 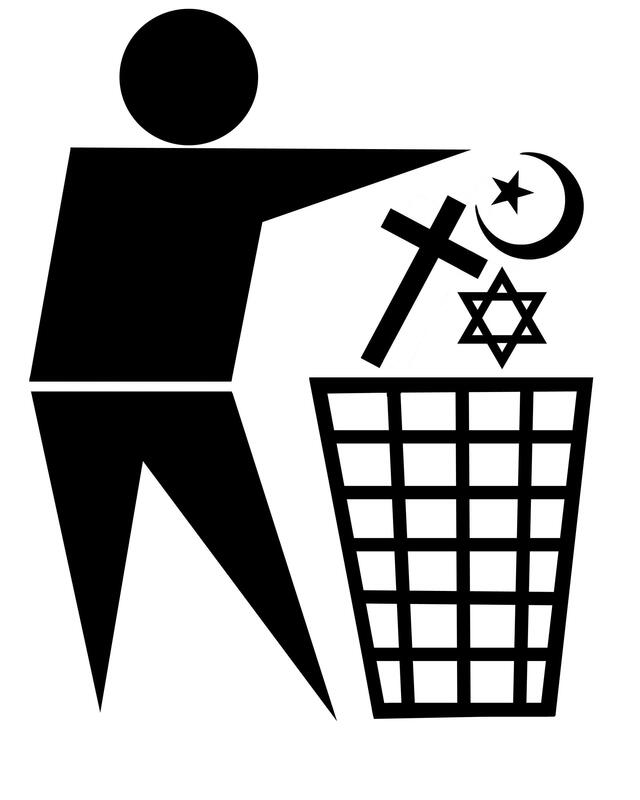 I have recently become active again at blogging about atheism. Other sites that I administer are listed in the left column of this page. Well, for obvious reasons. The most predominant reason is that religious doctrines never reflect the truth. Every major religion teaches that the truth is of upmost importance but ironically, the doctrines themselves contain paranormal foundations. Logical thinking and decision making require truth to be of upmost importance. If you let people carry on their lives believing in imaginary gods and imaginary concepts like life-after-death then their lives are out of step with reality. This causes people to waste their only life as they live under these misconceptions. Sometimes religious people willfully end their only life believing that they will carry on living a better afterlife. In some cases they kill other people in the process of taking their own life. "A necessary stance of supernatural religions is that one's faith must over-ride or control one's reason; for the believer, logic is secondary to faith. This subjecting of humankind's highest natural power to faith can lead to various sorts of illogical and destructive results: inter-faith terrorism, over-population, repression of free scientific inquiry, impoverishing the poor and ignorant contributors to dubious causes, to name a few. But I think the most destructive result of subjecting reason to faith is the loss of respect for our highest power, the logical human mind with its ability to problem solve responsibly." An old man walks down to a beach on the west coast of Africa one hot day to find a young boy frantically tossing turtles back into the ocean. The old man knew that the beach was littered with the turtles as far as the eye can see and that the phenomenon happens every year. So he asked the boy, "And what do you think you're doing?" The boy answered, "These turtles are dying in this hot sun." The old man then exclaimed to the boy, "Well I hope you don't think that you are going to make a difference. The beach is full of these turtles for miles and miles and they are all going to die in a couple of hours in this sweltering sun. The only difference that you will be able to make will be comparable to a drop in an ocean." The boy then turned to the old man, looked him in the eye, waved a turtle in front of his face and said, "Try telling that to this one. ", as he threw it as far as he could back into the sea. In the above story I am analogist to the boy, the old man represents the people in my life that tell me not to bother with religious believers, the hapless turtles are religious believers, the sweltering sun is their religion, and the ocean represents freedom and life. This story may be off-topic here, but I will expand this section extensively at a later date, probably as a separate web page, or pages. For now I want to introduce as many sections as possible to the document. Religious institutions will become defunct whether I write about it or not. One only has to look at the past few decades of census of industrialized countries to conclude that non-believers will greatly outnumber believers sometime in the next few decades. This change of mind set of laymen will exert great pressure for change on society. The United Kingdom's 2001 census reports that less than half of the British people believe in a God. "Religion in Britain has suffered an immense decline since the 1950s, and all indicators show a continued secularisation of British society in line with other European countries such as France. ", writes Vexen Crabtree of London. Click on his name for his excellent report of the status of religion in the U.K.
Canada's 2001 census reports... "Prior to 1971, fewer than 1% of the Canadian population reported having no religion. In 2001, that percentage increased to 16% of the population." A survey conducted by Canadian Press Harris-Decima in 2008 has found that 23 per cent of Canadians said they did not believe in any god. Click on this next link for a news story on the Canadian Press Harris-Decima survey. In New Zealand, census figures from 2006 show 32% of New Zealanders now consider themselves to have no religion. In Australia the number stating 'no religion' continues to grow, from 16.6 percent in 1996 to 18.7 percent in 2006, with the growth greatest among the younger age categories. These really are statistics leading to the demise of religion when you consider that it is older age people who are the most religious. Many younger people have no use for religion and as the older generations die off over the next few decades the tables will turn to favour a non-religious majority. Certain death will come to most religious institutions when church properties are taxed. Currently in most democratic countries religious institutions benefit from property tax exemption. When religious institutions have to pay their equal share for municipal services such as roads, sidewalks, and lampposts, many will fail to come up with the cash and will lose the luxury of having their own place of worship. Fewer places of worship means fewer people employed in the religion industry. This will significantly contribute to the demise of the religious establishment within society. Before politicians are moved to tax religious institutions and church properties, atheism will have to become recognized as a "cause". This is occurring on the internet but the media is not reporting it as such--so far. After atheism is recognized as a cause, another level of awareness that will occur is the degree of commercialization that has built up around anti-theism. How many t-shirts, books, documentaries, lectures, non-profits groups, etc., does it take to comprise a cause? I love encouragement. If you want me to continue my efforts to have the world understand that religion is harmful to society and mind fraud to individuals, then please send me a positive comment, or ideas that would help me. You could also make a donation, but remember, this website is not involved with a registered non-profit organization and therefore, your donation is not tax-deductible for federal income tax purposes.